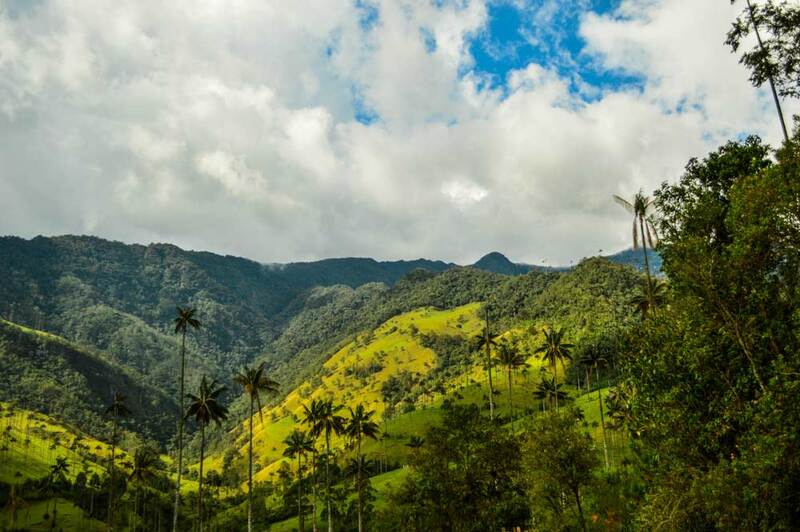 Salento is a beautiful town that sits a few hours away from Bogota. There are many ways to get to this charming destination, and one of the easiest methods is with buses. Since Salento doesn’t have a bus terminal like that of the bigger cities, transit buses need to be taken at Armenia or Pereira. Below is a complete guide on how to get to Salento from Bogota and from Bogota to Salento. Unlike from Salento to Medellin, there is no direct bus from Bogota to Salento and vice versa. Travelers need to transit via Armenia or Pereira. Both Armenia and Pereira are located less than an hour away from Salento, which makes the transit ride short and sweet. Tip:Transit from Armenia between Bogota and Salento, or vice versa, is a bit shorter and more frequent. I recommend taking a bus to Armenia from Bogota. From Bogota, I took a 9-hour bus to Armenia before grabbing a smaller public bus that arrived in the Salento plaza. The Bogota to Salento bus can be booked online from Expreso Bolivariano (schedule) or Expreso Palmira (schedule) for COP 49,000 (US 15). There are a number of other options as well, and it may be best to check at the Bogota terminal – Terminal Salitre prior to departure. After arriving in Armenia, the bus will stop in front of Terminal Armenia. Tip: The Bogota to Armenia bus may not park inside the terminal, so be aware of missing the stop! Once there, do head inside the terminal and pass all the booths. Proceed to the parking lot at the back of the terminal.If you walk straight out into the parking lot for a couple of meters, there will be a small sign that states ‘Salento’, probably alongside a handful of backpackers.A COP 4500 (US 1.5) ticket is purchased on the bus. This 45-minute ride runs every 30 minutes from 5:30 am in the morning. Tip: Do leave Bogota before 11:00 am in the morning if you’d like to make the Armenia-Salento transit before the end of the day. Buses from Salento to Armenia leave every 20 minutes between 05:20 am to 20:00 pm from the main square. It is best to ask a local for the exact spot of this stop since there aren’t any signs. After passing through the main square, the autobuses will stop at the Salento Transport Office before making its way to Armenia. These buses cost COP $4500 (US 1.5) and are approximately 45 minutes in length. To catch the town center stop back to Armenia (or onward to Pereira) requires one to stand at a corner in the main plaza. Tip: These autobuses will go directly to the Salento Transport Office on the weekend. Get off the bus once you reach Terminal Armenia. Once at Terminal Armenia, look for booths with buses that head to Bogota. The Armenia terminal is quite small, so it is very easy to see the signs that are displayed in front of each booth. Depending on which terminal you’d like to get off in Bogota, the bus choices may differ. Expreso Bolivariano and Fronteras are two operator choices that have a number of bus timings available to choose from. Above is a screenshot of Expreso Bolivariano’s bus schedule, as you can tell, sometimes weekends are cheaper than weekdays! But there are only a few options a day, do find out the departure times beforehand! Tip: Since the ride from Armenia to Bogota is quite long, I recommend taking a night bus. Although bus operators usually say the length is 7 hours, I see most buses from Armenia to Bogota taking up to 9 hours! Guatapé: The Most Colorful Town in Colombia?